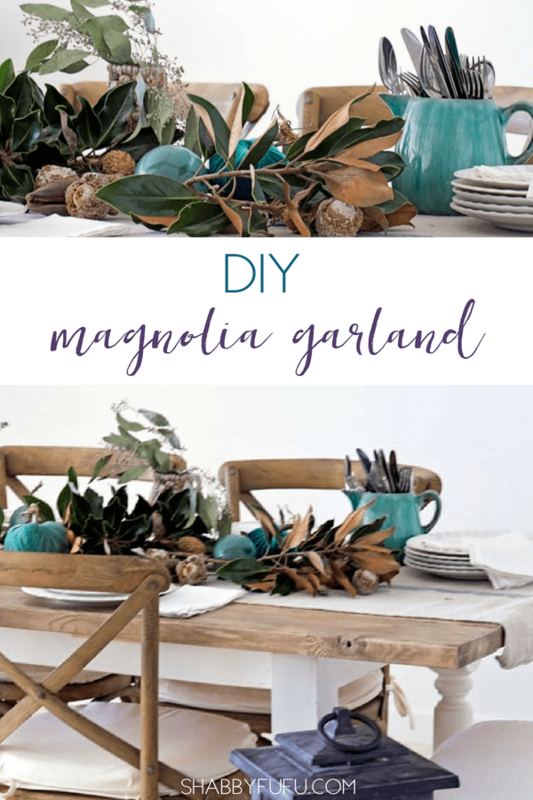 Magnolia garland DIY. 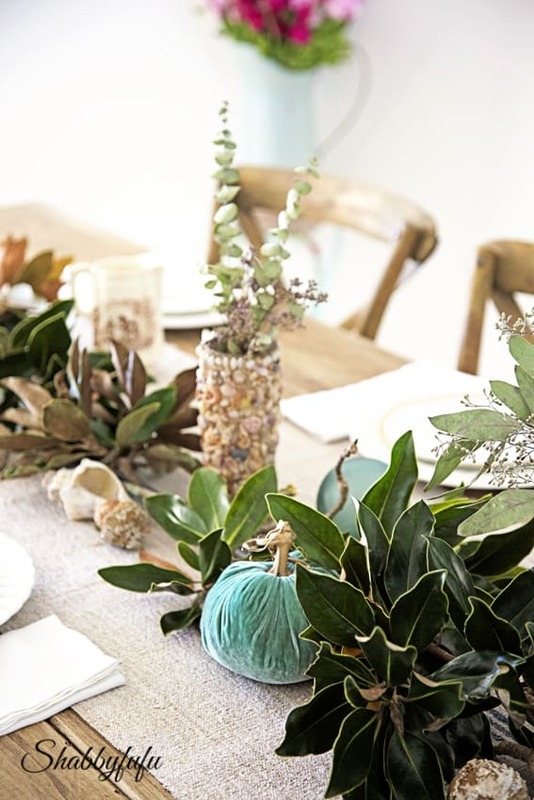 Learn how to create a simple loose magnolia leaf garden with these easy instructions for setting a fall centerpiece on your table. This weekend we spent up at the beach house and one could have almost forgotten that it was fall, except for the fact that Saturday was Halloween followed by turning back the clocks. 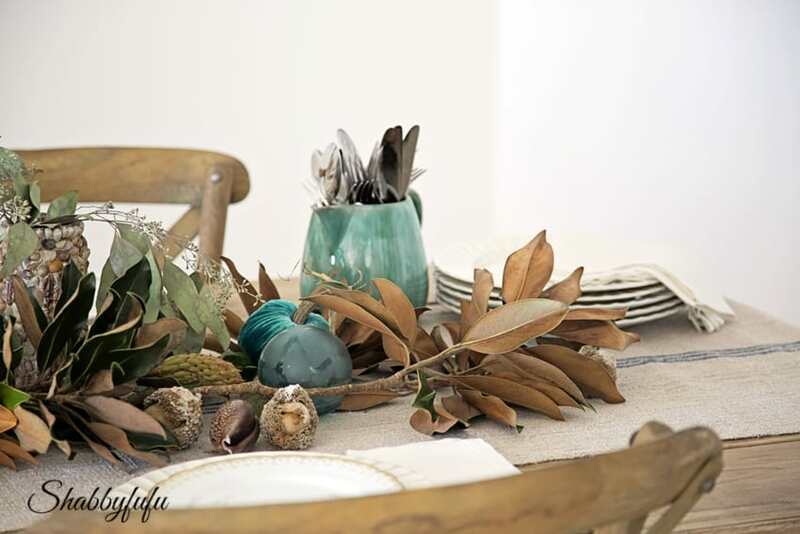 Not ready for decorating for Christmas, I’m still enjoying adding touches of autumn to the tables at the beach and at home. I put together a video for you below to help you design your own MAGNOLIA GARLAND. 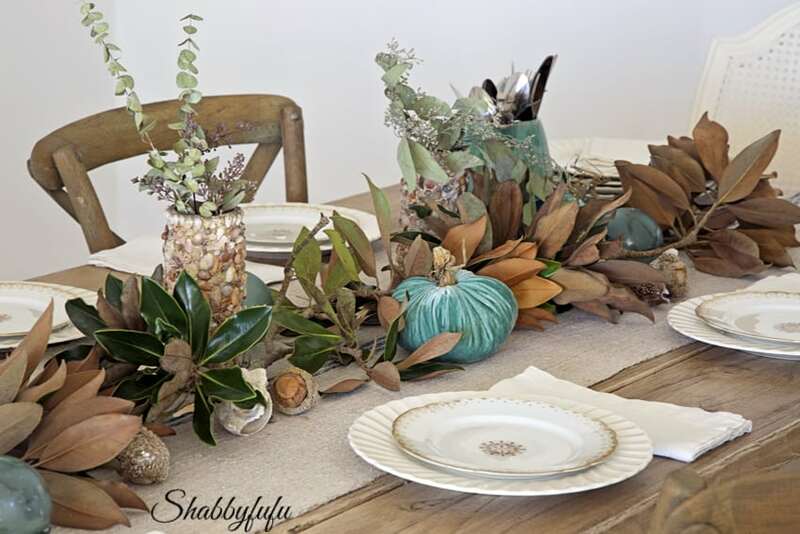 But back to why I’m still loving fall with planning for Thanksgiving where we will have everyone up at the beach house. 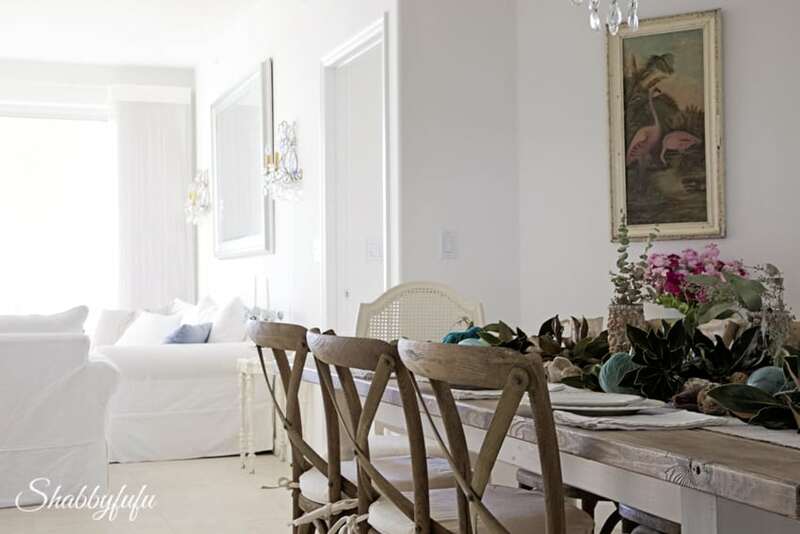 Our farm table that I talked about building in THIS post is long and narrow and seats 8, and I generally style it with a garland running down the middle. Keeping it low allows every to see and engage in conversation. On my early morning walk I passed by a couple of magnolia trees growing by the side of a road and helped myself to some branches. I couldn’t grab enough to carry with me to make the long garland that popped into my head, but I did help myself to enough to drape in garland style down the center. 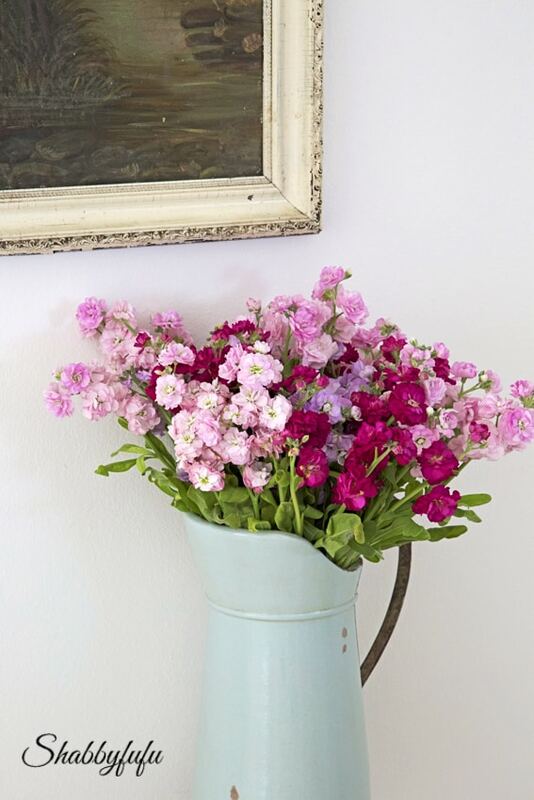 This is the easiest thing to make…I almost hesitate to call it a magnolia garland diy. Before I started working on the table I check for bugs and then I laid down a French grain sack runner to keep any dirt off the table top. 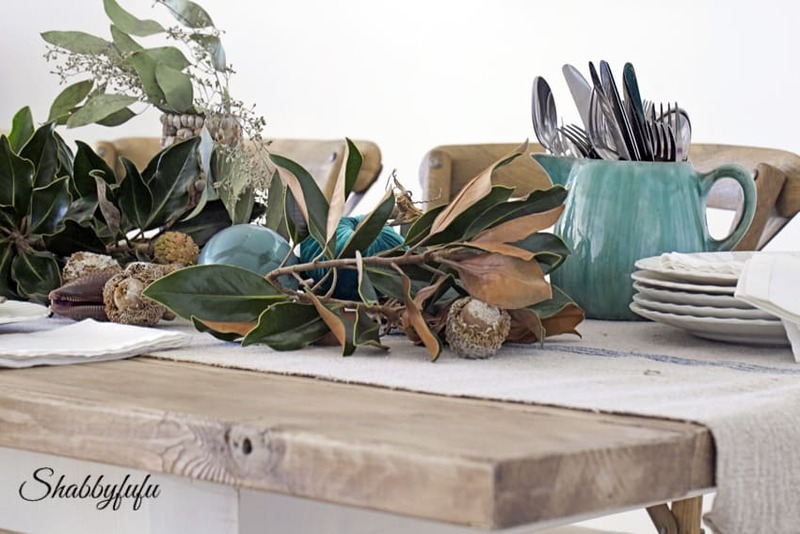 Once I arranged the magnolia branches I shopped the beach house for a few things to add into the arrangement that looked beachy. 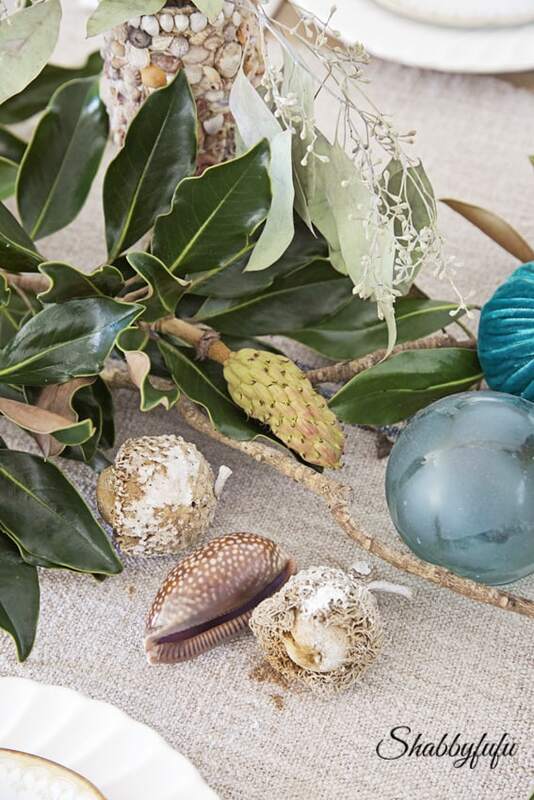 When you arrange the leaves for your magnolia garland diy project, be sure to have some of the back lighter side showing as well as the waxy front. If you don’t have magnolia around where you live or aren’t a DIYer, I have some faux magnolia garlands and wreaths for the ready listed below. SCROLL AND TAP THE IMAGES TO SHOP THE POST! 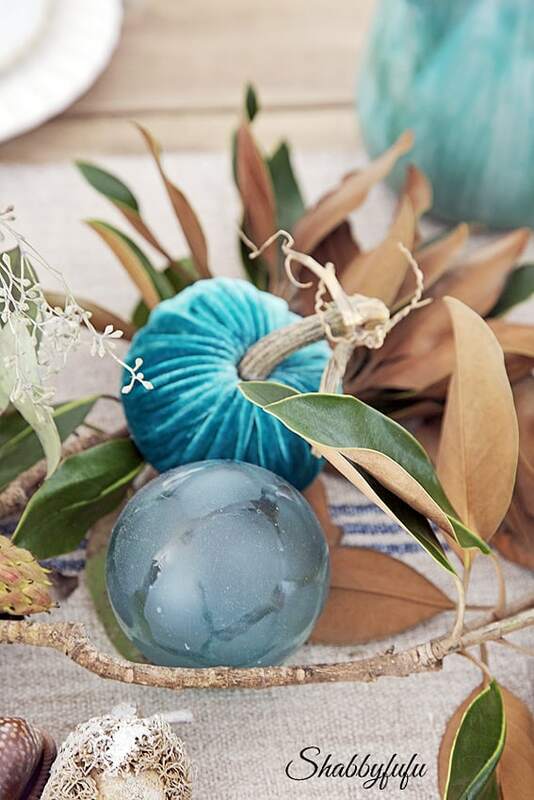 A few old glass fishing floats in aqua and some silk velvet pumpkins (see another styling in THIS POST) of a color that I love. In fall the bottom side of magnolia leaves turn a copper color that is perhaps the only bit of leaf color we see in the south this far down. Vintage ironstone plates and some pretty and faded plates with gold trim that I picked up at a yardsale last year. 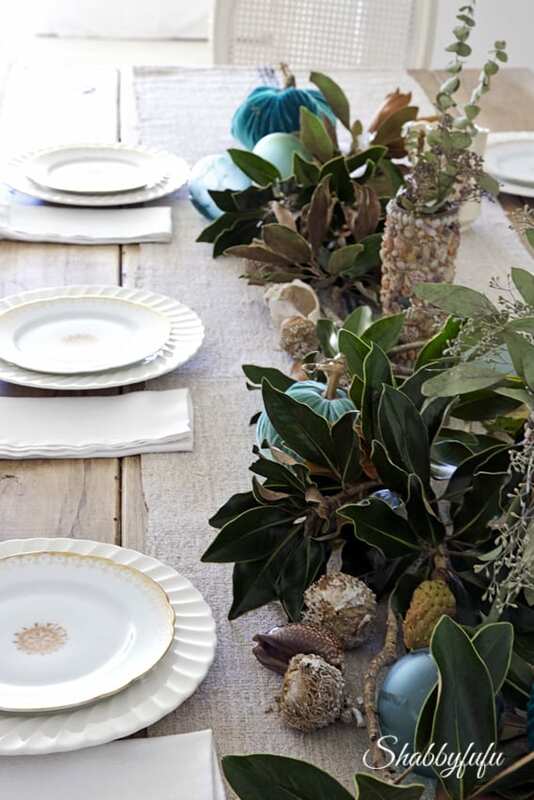 Vintage white linen napkins, oversized acorns that I sprinkled with glitter and a few sea shells picked up just outside the door on the beach. So far I’m loving the white pottery barn slipcovered sofas in the living room that I talked about in THIS post and they are holding up to people and the dogs. My oversized pitcher is filled with stock in the prettiest shades that I bought for just $7 a bunch at the market over the weekend. I’m going to try and see how the magnolias will dry out and whether I can use them for the Thanksgiving table, but honestly I have no clue at this point. Beautiful, Janet. 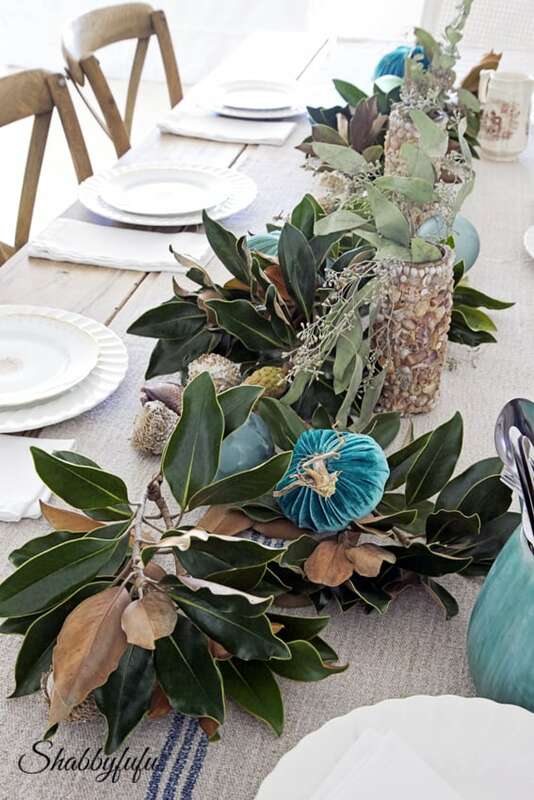 I want to do a garland too on my tables to keep it low. I used cut magnolia in an arrangement for Christmas a couple years ago and they really dried out. There is a method of soaking the leaves, but I haven't done it before. I searched your site trying to find out about the chandelier above your beach house dining table – but I came up empty. Can you tell me where you bought it; or did you create it? 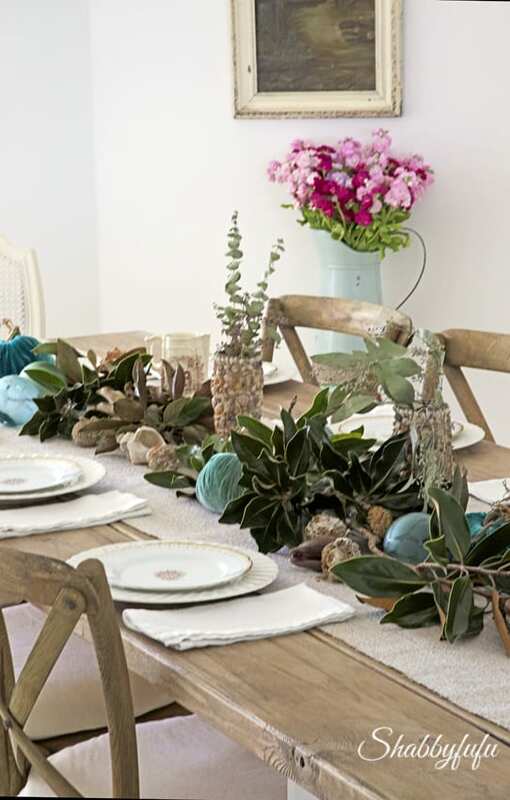 That magnolia garland is unique and stunning! What a gorgeous garland, Janet! I love the colors for a beachin' Thanksgiving celebration!! It looks beautiful Janet. 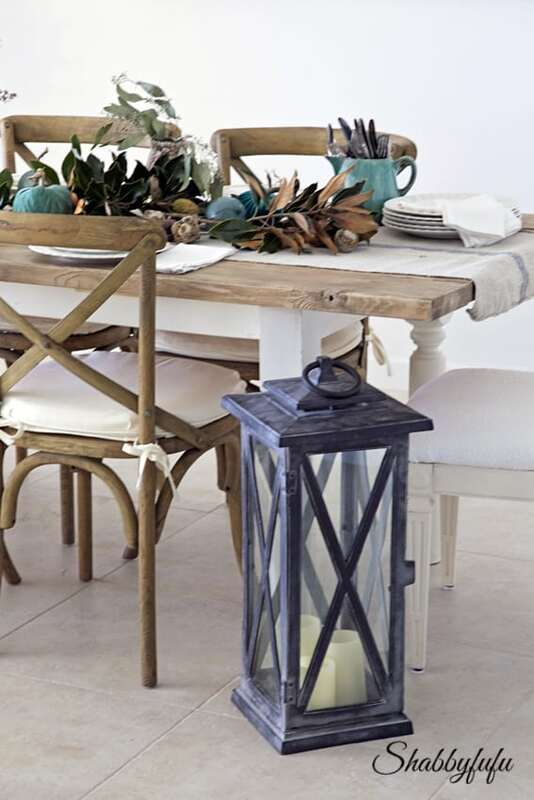 I've been wanting to build a table myself and yours is very nice with the narrower width but plenty of length with a nice rustic top. So glad to hear it! Just be careful that the magnolia is bug free when you bring it inside…although personally I’ve never had an issue.